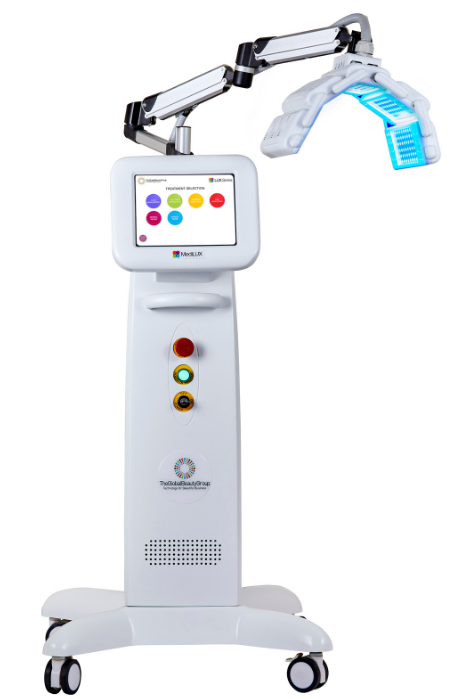 Advanced beauty specialists, Advanced Esthetics Solutions, have introduced the MediLUX system, which uses near-infrared light to rejuvenate, tighten and repair ageing skin. The system has an extended LED panel and high energy output, using five wavelengths of light therapy technology to deliver targeted dermal repair, on all areas of the body, not just the face, neck and décolleté but also the stomach and back. The MediLUX works by harnessing near-infrared (NIR) light which increase white blood cell production, thus regenerating, rejuvenating, tightening and repairing aged skin. Adenosine Triphosphate (ATP) is boosted, promoting DNA repair and cellular regeneration. Skin and tissue inflammation is reduced whilst lesions and wounds heals faster. Collagen and Elastin production is stimulated, and blood circulation and cellular oxygenation are boosted, which stimulates a release of toxic wastes, leading to skin regaining a healthy and radiant glow, with improved clarity, tone and texture. In addition, Blue Light reduces sebaceous activity to clear congestion and eliminate acne-causing bacteria; Green Light aids detoxification and reduces redness and irritation; Yellow Light stimulates Collagen and is beneficial for Rosacea sufferers and after Laser treatment; and Red Light increases circulation and lymphatic flow, promoting a youthful looking complexion. The MediLUX comes with pre-programmed treatments for Acne Management, Skin Tone Correction, Redness Reduction, Age Reduction, and Dermal Repair, and is available from Advanced Esthetics Solutions.